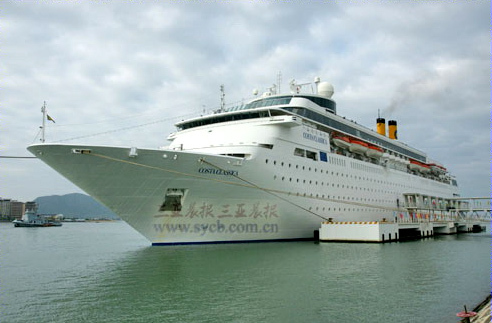 On the morning of Thursday, 2011, “Costa Classica”, the luxury Italian cruise liner, berthed at Sanya Phoenix International Cruise Terminal with 1,100 passengers from Europe and 600 crew members on board. It is the first time for the “Costa Classica” calling at Sanya port. It plans to visit Sanya 4 times in February and stay in Sanya for 10 hours. Dubbed as a "floating 5-star hotel", the Costa Classica cruise liner is 220 meters in length and 53,000 tons in weigh. On that day, nearly 200 European visitors visited the Statue of 108-meter-high Nanhai Guanyin, the largest statue in the world, and experienced Chinese Buddhism culture and charming tropical sceneries. Many visitors spoke highly of the statue and said this was an incredible masterpiece in the world.